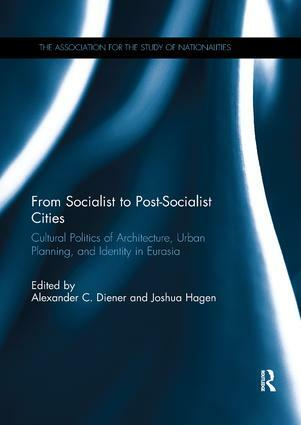 The development of post-socialist cities has become a major field of study among critical theorists from across the social sciences and humanities. Originally constructed under the dictates of central planners and designed to serve the demands of command economies, post-socialist urban centers currently develop at the nexus of varied and often competing economic, cultural, and political forces. Among these, nationalist aspirations, previously simmering beneath the official rhetoric of communist fraternity and veneer of architectural conformity, have emerged as dominant factors shaping the urban landscape. This book explores this burgeoning field of research through detailed cases studies relating to the cultural politics of architecture, urban planning, and identity in the post-socialist cities of Eurasia. Alexander C. Diener is an Associate Professor of Geography at the University of Kansas where he works in the field of political and social geography. His research explores the relationship between identity and place through the themes of geopolitics and borders, nationalism and transnationalism, mobility and migration, and urban landscape change. His regional expertise includes Central Asia, Russian borderlands, and Mongolia. Joshua Hagen is Professor and Chair of the Geography Department at the Marshall University. His research focuses on the political geographic dimensions of nationalism, borders, international relations, totalitarianism, urban design, and historical preservation. He has worked on these issues in European, Eurasian, and North American contexts.